We're spending the week in beautiful Seaside, Florida (Watercolor to be exact), so I am taking a little break from the blog. I'll have a few guests posts coming later this week that you'll definitely want to check back for. In the meantime, be sure to follow along on Instagram and Snapchat (nicolemelv) for all of our beach adventures. We're having a great time and capturing it all! I wore this little red dress from Madewell for the 4th. It's on major sale right now, and happens to be super comfortable and flattering. Since it was a casual night of fireworks on the beach, my Jacks worked fabulously as shoes. 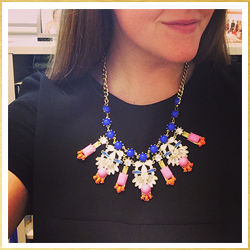 Of course I wore my navy kate spade studs and a sparkly necklace that I've linked below. Enjoy your week and my guest posts! See y'all soon! Absolutely love your 4th of July outfit! What an adorable dress! So festive :) Hope you are having a wonderful vaca!! You look so adorable in the dress Nicole! Hope you're enjoying beach life! Im missing it so much already!